Longborough Festival Opera is Bayreuth in the Cotswolds, our almost-local 500 seat auditorium, converted from a giant chicken shed, with the seats bought second-hand from Covent Garden. Its founders, Martin and Lizzie Graham, built this mini-Bayreuth in their own backyard with the inspired-lunatic idea of staging Wagner’s operas in the correct grand style, but on an intimate scale. They built a Bayreuth-style covered orchestra pit large enough to accommodate a 70-piece band – and there are trumpet fanfares from the balcony warning you of the end of the intervals. Even now, though the Grahams staged a complete Ring in 2013, having started with Das Rheingold in 1998, it seems a mad thing even to want to do it. But the Ring was superlative, a production, which those lucky enough to hear, will cherish the memory of for their entire lives. It’s the music that matters. Second-rate Wagner is worse than no Wagner at all; and Longborough has achieved the near-impossible, giving us consistently first-rate performances. Much of this distinction is owed to the conductor, Anthony Negus, who worked with Reginald Goodall and, as a student, was in the Bayreuth pit for performances conducted by Boehm, Kempe and Knappertsbusch. This season’s Wagner offering, Tristan und Isolde, has the additional benefit of featuring Rachel Nicholls, the splendid Longborough Brünnhilde, as Isolde. Small though she is of stature, her voice is now almost too big for the little auditorium; when she powers up to ff she could easily manage to project to the gods at the London Coliseum. Even in her mightiest passages, you had the feeling she was holding a little something in reserve. The worry was could she manage a piano legato line? She could – and did, in every posture a director could devise, from being on one knee to flat on her back, and these moments brought out the warm beauty of her voice not always evident when she was at full blast. Her final Mild und leise was delivered with such confidence and conviction that the audience was hushed for what felt like a whole minute after the last orchestral note faded. From where I sat (in the amazing “Valley Box” – highly recommended) Nicholl’s expressions and gestures appeared subtle and appropriate. Her Tristan was a triumphant Peter Wedd, whose ardent, baritonal heldentenor was notable for the power of his lower register as well as warm sound he made in the upper part of his voice. Not only was there no break apparent between the chest and head voice, the only time I was conscious of him even using his head voice was a single falsetto note. Again, I wondered whether he was capable of projecting at anything softer than f, but in Act III he showed what he could do. Musically this was a very rewarding performance (and the same goes for Stuart Pendred’s Kurwenal and to the more lyrical aspects of Catherine Carby’s Brangäne). Wedd looks as though he’s fairly tall and lanky, but in this wig-free production, his own cropped hair appeared to be grey (not the blond I’m told it is), and from where I sat he was an elderly Tristan. Moreover his stage movements were ungainly and unlovely – clunky, even clumsy. Perhaps this was the fault of the director, Carmen Jakobi (who is married to the conductor, Anthony Negus). If she did not intend her Tristan to lurch about the stage, she might well have told him to try for the sort of stillness and economy of motion he achieved (pre-death) in Act III. There was another, more conceptual problem: should Tristan be fondling Isolde’s bottom just as they’ve been (as it were) introduced over the love potion? I suppose that’s one way of reading the situation; but surely the music is telling us that delay is the essence of gratification? Isn’t the arrival and attitude of King Marke in Act III a clue that the relationship of Tristan and Isolde is one of non-consummation? There is one dreadful error in this production – not fatal, thanks to its superb musicality, design and lighting, but painfully distracting. Jakobi says in a programme note, “Richard Wagner called Tristan und Isolde an action, not an opera. Yet there is very little stage action as such.” So in the “long passages in which no action seems to happen [though] there is seismic emotional activity in the music that expresses the characters’ inner turbulence” she has inserted a pair of dancers. She has dressed this with a peppering of Jungian terminology – but it still amounts to a failure to trust the score to tell the audience what the characters are feeling, which just is what is going on in the opera at that point. Comely as the dancers are, they are at best redundant, and at worst, harmful to the work. I admit it, in Act III I had to look away from them, as I felt Tristan’s final scene was being ruined. It is nearly always a mistake in a production to introduce new characters, whether they’re meant to double existing ones or represent some aspect of them. Every director should be proficient in the use of Occam’s Razor. There was so much that was good and enjoyable in this production that it’s a shame to have to cavil. Negus’s orchestra was glorious throughout, but in the Act III prologue he brought out the detail of the bass instruments more clearly and distinctly than I have ever heard. 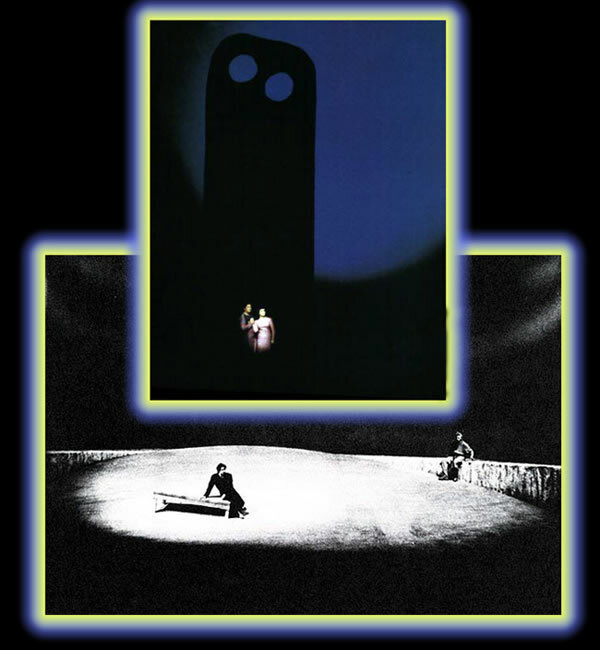 Kimie Nakano’s Act III sets were, said the distinguished critic sharing my box, an exact replica of Wieland Wagner’s 1962 Bayreuth sets – though when I looked it up, the Bayreuth monolith seems to have two holes in it to Longborough’s single one. (The Longborough set seemed to owe a good deal to the angular, spiky work of the post-War British sculptors such as Lynn Chadwick and Reg Butler as well as Henry Moore.) All three of Nakano’s sets, one per act, were simple and dignified, with shiny reflective flooring and uncluttered – a squared-off-horseshoe bench in Act I – with a good deal of atmosphere generated by Ben Ormerod’s lighting and the back-wall projections of simmering lights or colour-fields (à la Morris Louis rather than Rothko). If only the director had gone all the way with simplicity, this would have been a Tristan for the ages. What I think she forgot was the special character of the place we were in. Any opera performed in this space is a chamber piece. The USP of Longborough is that you can see the singers’ faces from every seat in the auditorium, and the singers never have to shout, not even to be heard above a Wagnerian orchestra. Everything is clearer, even the surtitles. Jakobi shares the credit for their excellent translation, which sometimes caught Wagner’s poetry as well as the meaning of his weird German, with another Graham family member, Cordelia. My only query about these was the use of the term “atonement,” especially when the surtitles have Isolde saying, “let us drink atonement.” You can drink “a toast” “a health” (or a beer) – but “atonement”? It made me almost as uncomfortable as the dancers’ bodystockings. If Longborough can maintain the musical standard of this Tristan, and cut the faffing about with the dancers, it will have a bankable production, capable and worthy of frequent revival.